Squirrels are adorable little animals, but they haven't been domesticated for centuries like dogs, cats, rabbits and other companion animals have. If you want to raise a squirrel as a pet, you'll need to provide specialized care, as well as make changes to your life and home to accommodate your new furry friend. Baby squirrels shouldn't be separated from their mothers until they're at least 15 weeks old. Often babies will stay with their mothers until she has another litter of pups, but they're old enough to live on their own at this age. If you're adopting a squirrel that you found in the wild, it's important to have the animal checked for disease or parasites by a veterinarian. After your squirrel has acclimated to her new home, it's important to gently handle your young squirrel often, so she becomes accustomed to human contact and associates you with positive experiences. Allow all the members of your family to carefully handle your squirrel so she isn't fearful of them and doesn't become overly attached to one person. Your squirrel will need a large cage, at least two feet wide, two feet deep, and several feet tall. Bird cages work well for squirrels because of their vertical structure. Your squirrel will need things to climb and chew on to satisfy her natural squirrely behaviors. Wooden structures and clean branches are best. She'll need bedding such as hay and a nesting box so she can build herself a cozy place to sleep. You can buy specially designed squirrel food called rodent blocks at pet stores. These can make up the majority of your squirrel's diet. She should also eat fresh foods like insects, grubs, worms, fruit, nuts and seeds regularly. Provide fresh water in a shallow dish. Squirrels need calcium to keep their bones strong, so giving her chew bones will help her wear down her ever-growing incisors and get much-needed calcium in her diet. Squirrels are social animals. 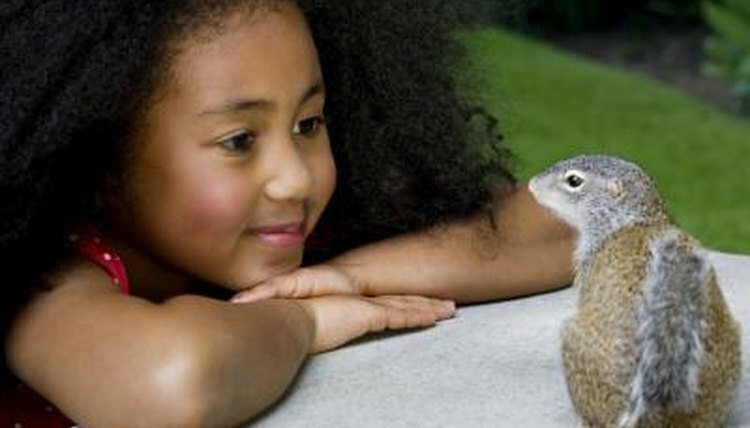 To make your squirrel happy you'll need to spend lots of time with her each day, and/or adopt more than one squirrel. Even if she has ample cage space, your squirrel will still need some time outside her habitat to roam and play. Ideally she'll go outside for at least 30 minutes a day so she can get a daily dose of vitamin D-rich sunshine. Keep in mind when playing with your squirrel that these animals aren't fully domesticated, and although they're latrine animals, meaning they limit their elimination to one area, they may relieve themselves in places outside their cage or on you. It's also common for squirrels to bite, if only in a playful way. Squirrels have no bite inhibition and can do serious damage with their sharp incisors. Also, squirrels like to climb on their human companions but their sharp claws can do real damage. Squirrels are known to go through a mood change during mating season. Squirrels are often grouchy and prone to biting when they're "in rut." Tree squirrels reach sexual maturity at eight to 11 months old. They go through two breeding periods a year, one from late winter to early spring and another from mid-summer to early fall. Even if you own a male and female squirrel, the chance of reproduction is very small because squirrels don't tend to breed well in captivity. Squirrels are wild animals not traded on the traditional pet market. It's not legal to own a squirrel as a pet in all municipalities. Also you may need to get a permit to keep a squirrel legally. Make sure to check with your local government about laws pertaining to squirrel ownership before you decide to keep one of these animals in your home. Squirrel Refuge: So You Found a Baby Squirrel, Now What?